Hire Purchase is one of the most commonly used modes of financing for acquiring various assets. It aids by spreading the huge cost of an asset over a longer period of time. Thus, it frees a lot of capital to be directed to other important purposes. 3 HOW THE TRANSACTION / PROCESS OF HIRE PURCHASE TAKES PLACE STEP BY STEP? Hire Purchase is defined as an agreement in which the owner of the assets lets them on hire for regular installments paid by the hirer. The hirer has the option to purchase and own the asset once all the agreed payments have been made. These periodic payments also include an interest component paid towards the use of the asset apart from the price of the asset. The term ‘Hire-Purchase’ is a UK term and is synonymous to ‘rent-to-own’ or ‘installment plan’ in various other countries. Owning goods through hire and purchase lets companies improve their earnings performance. Not just beneficial to the hirer, this system is also the most effective and secure form of credit sales for the current owner of the asset. Hire purchase is a method of purchasing or financing capital goods whereby the goods are accessible for use almost instantaneously but the payment is made in smaller parts over an agreed period. The ownership is transferred only after the paying all installments. Technically speaking, it is an agreement between the buyer (or user) of the asset and the financing company whereby the financing company purchases the asset on behalf of the buyer and the buyer utilized it for business purpose and pays back to the financing company in small installments called hire charges. 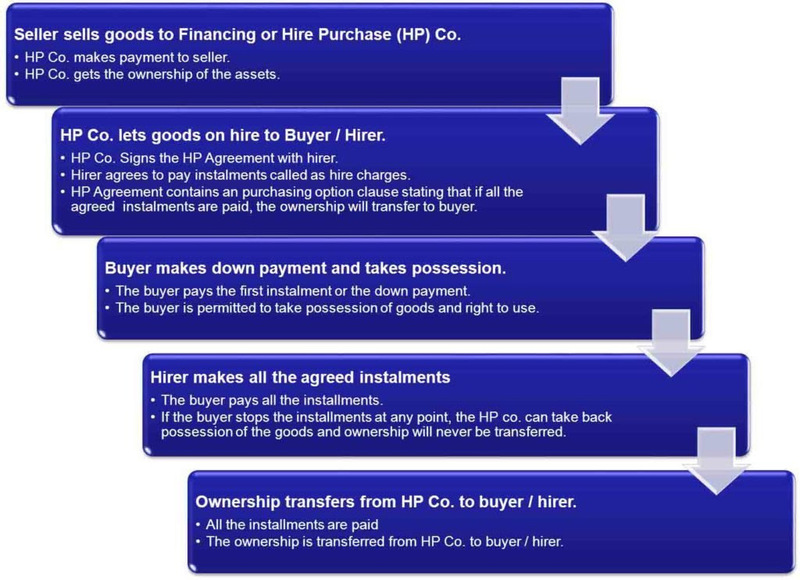 In other words, hire purchase can be defined as an option of financing or acquiring an asset for use whereby the financing company let the goods on hire to the buyer against small installments called hire charges and the buyer gets the right to use the asset with an option to purchase the asset by paying all such installments spread over a period of time. Hire purchase was very prominent for vehicle financing whether that is a personal car, commercial vehicle etc but now equipment, machinery etc are also financed with hire purchase method. Hire purchase is a typical transaction in which the assets are allowed to be hired and the hirer is provided an option to later purchase the same assets. Rental payments are paid in installments over the period of the agreement. Each rental payment is considered as a charge for hiring the asset. This means that, if the hirer defaults on any payment, the seller has all the rights to take back the assets. All the required terms and conditions between both the parties involved are documented in a contract called Hire-Purchase agreement. The frequency of the installments may be annual, half-yearly, quarterly, monthly, etc. according to the terms of the agreement. Assets are instantly delivered to the hirer as soon as the agreement is signed. If the hirer uses the option to purchase, the assets are passed to him after the last installment is paid. If the hirer does not want to own the asset, he can return the assets any time and is not required to pay any installment that falls due after the return. However, once the hirer returns the assets, he cannot claim back any payments already paid as they are the charges towards the hire and use of the assets. The hirer cannot pledge, sell or mortgage the assets as he is not the owner of the assets till the last payment is made. The hirer, usually, pays a certain amount as an initial deposit / down payment while signing the agreement. Generally, the hirer can terminate the hire purchase agreement any time before the ownership rights pass to him. HOW THE TRANSACTION / PROCESS OF HIRE PURCHASE TAKES PLACE STEP BY STEP? The following info graphics will explain how the transaction takes place. Immediate use of assets without paying the entire amount. Expensive assets can be utilized as the payment is spread over a period of time. Fixed rental payments make budgeting easier as all the expenditures are known in advance. Easy accessibility as it is a secured financing. No need to worry about the asset depreciating quickly in value as there is no obligation to buy the asset. Total amount paid towards the asset could be much higher than the cost of the asset due to substantially high-interest rates. The long duration of the rental payments. Ownership only at the end of the agreement. The hirer cannot modify the asset till then. The addition of any covenants increases the cost. If the hired asset is no longer needed because of any change in the business strategy, there may be a resulting penalty. Small scale companies and entrepreneurs can benefit from Hire Purchase. Expensive and important assets can be hired and later owned. This ensures that they can start using the asset from very first day and use the money earned to later buy the same assets. Hire Purchase is an important source of financing in recent times. It provides a convenient way to afford and acquire assets that otherwise be financially unattainable. Thus, hire purchase also helps a nation’s economy to grow further. However, before entering an agreement, one should clearly understand the costs involved and the disclosures provided. There are various other like term loan and installment purchase which looks similar but there is the difference between hire purchase and term loan and also there is the difference between hire purchase and installment purchase. I am a young entrepreneur from Ghana. I like your concept a lot. Wish u can help me more with your experience.